Breakthrough intelligent technology allows company to assemble more jobs, boards and components faster than ever before. 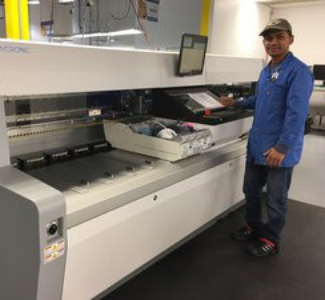 Advanced Assembly, a leader in quick-turn PCB assembly, announced the recent installation of MyCronic’s My300DX, the latest technology in assembly solutions for printed circuit boards (PCB). The addition of a My300 to the company’s manufacturing facility will allow Advanced Assembly to deliver new levels of PCB assembly speed, accuracy and flexibility to engineers across the country. In 2018, Advanced Assembly experienced double-digit revenue growth for the second consecutive year. The company expects additional growth in 2019 as it evolves to meet the increasingly complex PCB assembly needs and turn-times of design engineers. The My300 is twice as fast as Advanced Assembly’s existing pick-and-place machines and will help maintain the company’s 98.8% on-time delivery performance while adding capability to assemble even more unique designs. Precision and accuracy are everything when it comes to new technology and electronics. With the addition of the My300, Advanced Assembly continues to redefine the quick-turn PCB assembly market. Their devotion to improving processes and acquiring the latest innovations provides the highest level of quality and service to engineers across all markets. Advanced Assembly is the original and industry-defining quick-turn PCB Assembly service. The company has assembled over 40,000 unique designs in the last decade, more than any other PCB assembly service providers. Using a unique combination of real expertise, experience and operational excellence, Advanced Assembly delivers the best and fastest assembly in the industry. See the new My300 in action.